Lynne Caryl has been licensed in Acupuncture in the United States since1987. She also conducted advanced research at the Shanghai Hospital & Institute working with the Institute’s director Dr. Xian Ming Huang in China. She has also lectured extensively on the subject of diabetic care and continues her research on the treatment of chronic endocrine disorders. 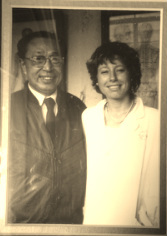 In photo: Dr. Xian Ming Huang and Lynne Caryl in Shanghai, China at the Shanghai Medical Institute in 1989. Lynne Caryl specializes in Diabetic Care, Pain Relief, Women‘s Health, and Facial Rejuvenation. Lynne Caryl is a primary health-care physician who offers light and sound-wave facials. This is a natural process that softens wrinkles, reducing cellulite and puffiness, while increasing collagen production and blood circulation, returning youthfulness and vitality to your face. Everyone will notice the difference and you will feel extraordinary after each and every treatment. Lynne Caryl uses a combination of traditional Chinese facial reading for health diagnostics, with personality reading, and psychological facial interpretations used by the CIA and the FBI to give you a deeper understanding of yourself. Lynne is currently working on a book on Face Reading in conjunction with a Taoist Master, Jeffrey Yuen, in New York. Lynne Caryl orders lab work and provides full reports on your resulting blood work. She will identify the specific that your body needs and create your customized nutritional maintenance program. Lynne Caryl offers deep-tissue therapy in addition to others modalities.